The Fan Shrimp Goby, Tomiyamichthys latruncularius, formerly known as Eilatia latruncularia, is a little known goby from the Red Sea and the Maldives that is rarely seen in the aquarium trade. 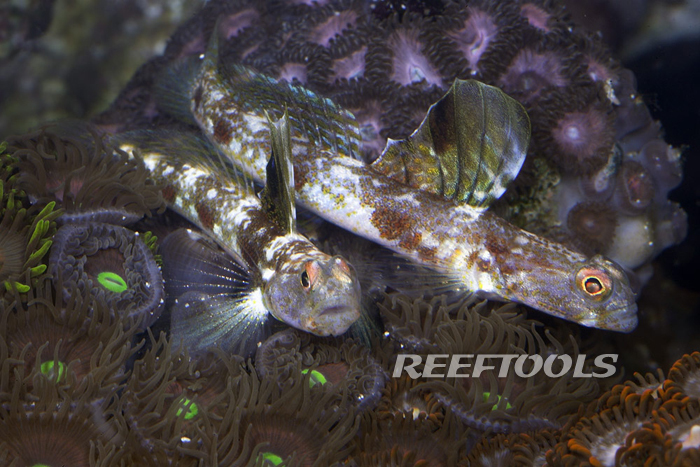 This beautiful goby is white with a mottled, iridescent copper and gold pattern. The dorsal fin is tall and rounded and has a dark brown blotch between the fourth and fifth dorsal spine. The males can be identified by filaments on the dorsal fin. It is often confused with its close sub-tropical relative the Monster Shrimp Goby or Mottled Shrimp Goby, Tomiyamichthys oni, which is found only in southern Japan and can be distinguished by a dark line running through each eye. In the wild Fan Shrimp Gobies are found living in pairs and form a mutual symbiotic relationship with Alpheus randalli, the Candy Snapping Shrimp or Red Banded Snapping Shrimp, but may pair with the Tiger Snapping Shrimp, Alpheus bellullus, in captivity. A Fan Shrimp Goby does not require a snapping shrimp in captivity, but is never found without one (or a pair) in nature. The snapping shrimp provides shelter for the goby and itself by digging elaborate burrows in the substrate while the goby hovers nearby, watching for predators. The snapping shrimp has poor eyesight and keeps an antennae on the goby at all times, ready to dart into the burrow if the goby signals danger by quickly flicking its tail. Every evening the gobies and snapping shrimps retire to their burrow, and the shrimp seals off the exits. 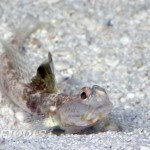 In the morning the gobies will emerge from the burrow and stand guard while the shrimp maintains the burrow; afterward they will forage for food. The Fan Shrimp Goby should be housed in an aquarium of at least 30 gallons with only small, peaceful tank mates. A deep mixed-grade sand bed with plenty of rubble and crushed coral will be needed for the shrimp to build its burrow. The Fan Shrimp Goby is very shy and may hide for the first few weeks after being added to the aquarium. 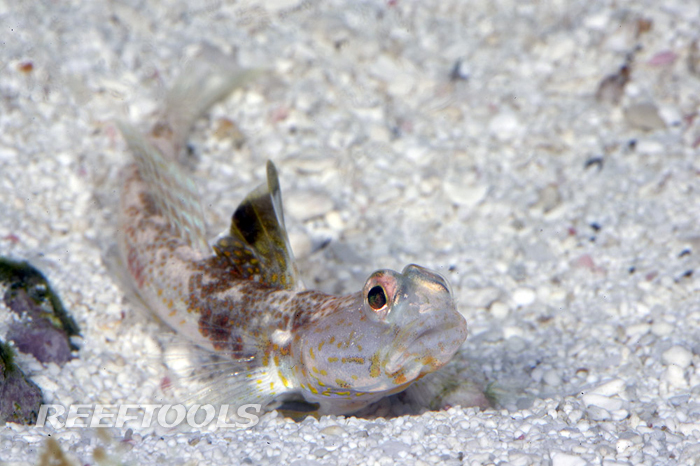 Frozen Mysis, brine shrimp, pellets, and most other foods are usually accepted by Fan Shrimp Gobies. The Fan Shrimp Goby is peaceful and may be kept with other shrimp-goby pairs as long as ample burrowing room is provided for each shrimp-goby pair.